Green chile. It’s delicious, spicy, and oh so satisfying. 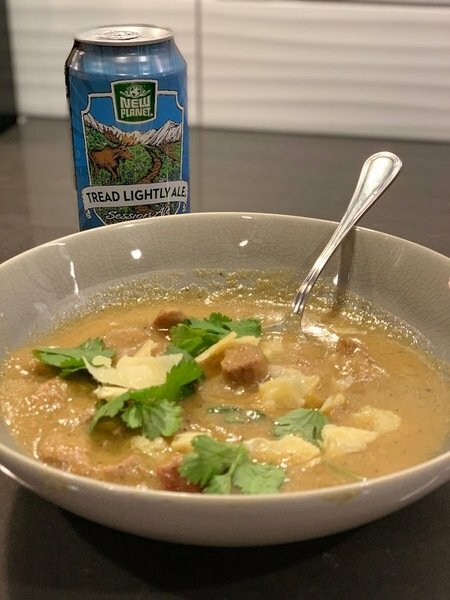 Tantalizing your taste buds and warming your soul, a bowl of green chile really hits the spot, especially on a cold winter day. Hatch season is a delight with the smell of roasted chile in the air. What’s even better? Freezing chiles to enjoy year round. If you don’t have frozen chiles, you can buy roasted ones in your grocery freezer section to use in this recipe. Traditionally, flour is used to thicken the green chile and give it texture. In this gluten free version, corn meal thickens the chile and adds a toasty note. The bone-in pork adds another layer of flavor to compliment the spicy chiles. There are a lot of recipes out there, many passed down for generations or meticulously fine-tuned over the years. Below is my version and it’s best enjoyed with a cold New Planet Pale Ale or Tread Lightly. Always great to enjoy a beer while the simmering chile fills the house with the smell of home cooked goodness. Heat Dutch oven or heavy bottom pan over medium/low heat. Add fat to pan, add onions, sauté until translucent. Add garlic, and sauté until fragrant, about one minute. Transfer veggies to bowl, leaving as much fat as possible in the pan. Brown pork in batches in a single layer of pieces over medium-high heat. When pork is browned and transferred out of the pot, keep 2 tablespoons of fat in pan. Sprinkle cornmeal in pan, cook until golden and fragrant, about two minutes. Slowly add chicken broth stirring continuously to avoid any lumps. Add green chile onions mixture, pork pieces, and bone from pork. Bring to slow boil, cover and simmer over low heat for 30-45 minutes. Serve with a warm corn tortilla or corn chips. An extra yummy option, sprinkle cheddar cheese and cilantro on top.